Over the years, Deloitte has developed a broad portfolio of skills-based volunteering programs: a formal pro bono program that deploys teams full-time, board service opportunities, week-long international service trips, and one-on-one coaching support for social entrepreneurs. The stepup program, one of the programs supported by Deloitte Consulting LLP, pairs professionals with local nonprofits to use their skills and experience to help tackle pressing challenges. In the last two years, stepup has grown to 10 chapters globally, engaged over 500 practitioners, and delivered over 15,000 hours of in-kind consulting to 50 nonprofit organizations. The stepup program allows participants to move from “team member” to “team lead” to “project advisor” to “program lead.” They are given the opportunity to “step up” into a stretch role where they learn through hands-on experiences and are mentored by leaders within the organization. In addition to social sector training, learning modules are developed in collaboration with Deloitte Consulting’s Learning & Development Team to help accelerate the development of skills that are often harder to learn in a classroom setting, such as dealing with ambiguity and owning client relationships. A strong emphasis on community building, innovation, and sustainable social impact is also built into the project experience to foster lifelong learning and purpose-driven leadership. Several years ago, pro bono was mainly seen as a volunteer activity to engage talent and make an impact in the local community. Today, it is much more than that. 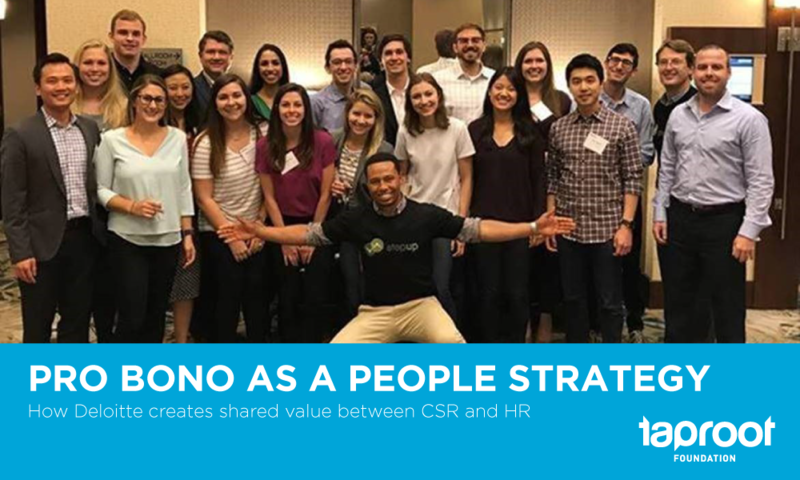 Deb Johnson, Deloitte Consulting LLP’s Chief Learning Officer, views pro bono as a powerful way to drive talent development and retention, and ultimately help professionals find purpose and meaning at work. Debbie Chou oversees Deloitte Consulting LLP’s Pro Bono Program and helped to support and grow these efforts. Her advice for other organizations hoping to do the same is to create buy-in by working directly with HR and talent leaders to design pro bono experiences that support their goals and are integrated into the organization’s talent strategy.